Anna and Jacques Favier present the two wines produced from their small Fronsac estate’s harvest. Our grand vin vintage wine is the most potent and complex in our range and also the wine with the greatest potential. It has a magnificent, shiny deep ruby colour, with a distinctive sheen of delicate, silky red fruit. Its graceful nose has a potent aroma of preserved fruits and a well-established woody bouquet, revealing a complex blend of red fruits and hints of flowers (violets). Tasting offers a seductive, aromatic palate with an harmonious flavour of red fruits, hints of vanilla and a blend of chestnuts and sweet chestnuts. 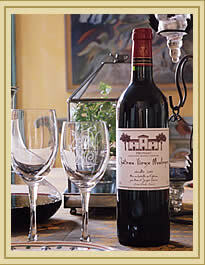 Its supple tannins make it a round and balanced wine that goes well with grilled meats and certain cheeses. After being aged in barrels for 15 months, this uncompromising wine is bottled and corked with demanding standards so it can be safely cellared for a decade or more. Like all great Fronsac wines, it deserves a few years’ aging that will bring out the topaz hues in its colour and allow its components to fully harmonise. « Château Vieux-Mouleyre » has been awarded with one of the golden medals at the February 2003 « Vinalies Internationales de Paris » and is mentioned in the “1000 Vins du Monde, la sélection des œnologues” Guide, and in the Hachette Guide. 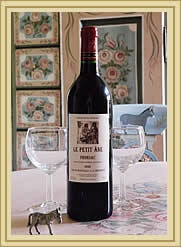 The second wine produced by the estate is bottled more than a year after the harvest. This wine is made with the same care and attention to detail and is aged in oak barrels.